Cleantech Open’s US National Accelerator Grand Prize of $50,000 goes to Inovues of Houston, Texas; and Saathi Eco Innovations of India takes home the 2017 Global Award in the Global Cleantech Innovation Programme (GCIP). 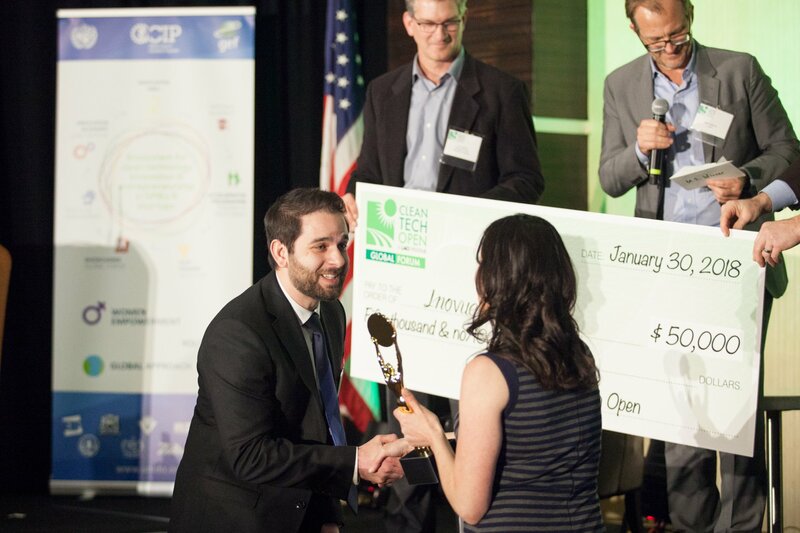 LOS ANGELES, Calif.—February 2, 2018—The Cleantech Open (www.cleantechopen.org), the world’s largest accelerator of early-stage clean-technology companies, announced the winners of the Cleantech Open awards for its US National Accelerator, Global Ideas competition, and Global Cleantech Innovation Programme. For the first time since Cleantech Open was established in 2005, the Global Forum, the program’s capstone event, was held outside the Bay Area together with Cleantech Open’s new parent organization, LACI (LA Cleantech Incubator). Thought leaders from the cleantech industry shared insights on the current and future state of innovation, including Matt Petersen, LACI President and CEO, Robert Weisenmiller, Chair of the California Energy Commission; Sarah Colao Wallach, COO at the Massachusetts Clean Energy Center; Ira Ehrenpreis, Managing Partner at DBL Partners; Xavier Helgesen, CEO & Co-Founder at Off.Grid:Electric; and Marion Enderlein, World Alliance Director at Solar Impulse Foundation. Since 2005, the Cleantech Open has trained and supported over 1500 early-stage clean technology startup ventures through its annual business accelerator. A majority of Cleantech Open alumni have survived the merciless technology startup "valley of death" and gone on to raise $1.2 billion in external funding and create over 3,000 clean economy jobs. US National Accelerator Grand Prize winner, as well as Infotech and Built Environment winner, was Inovues of Houston, Texas, a company developing the first external, non-intrusive window upgrade technology, which improves the insulation and energy efficiency of existing buildings while enhancing their appearance and durability. This year’s Energy Distribution Award went to Switched Source of Chicago, Illinois, for its innovative power-electronics solutions that increase reliability, efficiency, and renewable-energy hosting capacity on the legacy grid. Switched Source’s flagship device, the Tie Controller acts as a controllable valve to “push and pull” specified amounts of both real and reactive power in two directions. As a result, neighboring power lines can be operated as a networked platform, while providing all energy consumers with two sources of power. The Agriculture, Water, and Waste prize went to change:WATER Labs of Boston, Massachusetts, whose low-cost, compact, waterless toilet will serve non-sewered households and communities. The Advanced Materials Award went to CoolComposites of Boston, Massachusetts, for their development of an additive for building materials that reduces fire hazard from building insulation. This year’s Energy Generation Award went to Inergy of Pocatello, Idaho, for its design of one of the most compact, lightweight and portable solar generators in the industry. The Cleantech Open Global Ideas program is a global search for the most promising clean-technology ideas, held annually in conjunction with Global Entrepreneurship Week (GEW). This year’s Global Ideas Winner in the Seed Track went to MercuRemoval, an Israeli startup that has created a next generation mercury removal technology for use in power plant flue gas streams. In the Growth Track, Twine from Israel won with their unique, waterless dyeing and treatment process that requires only power and ink, eliminating the use of water, steam, pressurized vats and significantly reducing additives. In the Scale Track, Germany’s INERATEC won with their chemical reactor that can produce synthetic fuels from a broad range of different gas sources in a reactor no bigger than a desk. The Global Cleantech Innovation Programme (GCIP) is funded by the Global Environment Facility (GEF) and implemented by the United Nations Industrial Development Organization (UNIDO) in partnership with Cleantech Open, the world’s largest startup accelerator for clean and renewable technology. This year’s Global Cleantech Innovation Award winner, Saathi Eco Innovations of India, has developed one hundred percent biodegradable sanitary pads made from banana fiber. The runner-up team was TOM-CASAVA of Thailand with its innovative product based on activated carbon produced from cassava stumps. “Today, GCIP is the cornerstone of GEF support for small and medium enterprises. Innovation is critical to solving today’s global environmental threats. And, recognizing the central role of the private sector, we hope to do even more in the future. We need scalable, innovative ideas that embrace the opportunity that new technologies provide us with,” said Naoko Ishii, GEF CEO and Chairperson, in a video address to the Cleantech Open Global Forum participants. Cleantech Open is made possible by the generous support of our sponsors, including National Premier Sponsor, Wells Fargo, and our partners, the Global Environment Facility (GEF) and the United Nations Industrial Development Organization (UNIDO). LACI (Los Angeles Cleantech Incubator) runs the world’s largest clean technology accelerator program, the Cleantech Open. Since 2006, Cleantech Open has worked with over 1500 early stage cleantech innovators, helping them develop their business models, engage investors and secure first customers. Each year, as many as 250 companies participate in one of the Cleantech Open US, Global Cleantech Innovation or Global Ideas programs. Once a year, the best innovators from across these programs come together in celebration of their progress and impact in creating an inclusive green global economy. For more information, visit www.cleantechopen.org, or follow us on @cleantechopen and Facebook. The Los Angeles Cleantech Incubator (LACI) is a private non-profit organization helping to accelerate the commercialization of clean technologies and ensuring an inclusive green economy by unlocking innovation, transforming markets and enhancing community. Founded as a cluster-driven economic development initiative by the City of Los Angeles and its Department of Water & Power (LADWP), LACI is recognized as one of the most innovative business incubators in the world by UBI. In the past six years, LACI has helped 72 portfolio companies raise $159M in funding, $220M in revenue, create 1,700 jobs, and deliver more than $379M in long term economic value. LACI recently acquired the Cleantech Open to amplify and expand their positive impact toward building an inclusive green global economy. For more information, please visit http://laci.org and follow us on Twitter and Facebook @LACIncubator.